By default, the in-game "Camera Mode" (i.e. "C") key is used to switch to first person view while on EVA. Besides that, the mod enables you to restrict view to IVA and disable Map view when restricted to IVA. For those options see the configuration file in the PluginData folder of the mod. If using those features the Part Commander mod is recommended to have access to right-click menu actions from within IVA or first person EVA. Yeah works fine for me. Usually the mods are backwards compatible, except for Dmagic stuff which crashes my 1.3.0 install. That may be so, but I'm not doing too bad with my stable collection of updated mods running in 1.3. As I've said, the only one I can't update is DmagicUtilities. Loving this mod - using it with "Probe control room" for an immersive experience. One problem, though - my RCS translation controls (IJKL) in IVA (I play with forced) are not working - or responding at all. Can't get translation to work in docking mode either. Anyone else experienced this problem (I realise it may not be this mod causing the issue)? What other mods do you have installed? A log file would be useful. Love this mod a lot! It inspired me to make a KIS Holo Visor prop with EVA Propellant level indicator. Available in my KIS Wearable Props. I have an idea what's causing it, I've opened an issue on Github, will see if I can take a look at this soon. Assuming you are referring to First Person EVA, are you trying to use this while in an external command seat? What other mod does FPEVA? I keep seeing the Kerbals eyes in front of the camera when in FP view. Guess that is a bug? Also can't translate in EVA and when starting out on the launch pad - even though IVA is forced I can't get into IVA mode before hitting launch. A great plan for a mod, but with the "flying eyes" in front of my view, the immersion break when not possible to tune the monitors before hitting launch and not being able to properly do EVA (translate problems)... this mod is not usable for me. Any fixes would be nice! Well, I've gotten the first fixed (starting the launch in IVA), was actually written that way, so it wasn't a bug. I've added an option to force IVA before launch. The second, having the thrusters work, is harder, it looks like the internal code has been changed since this was originally written, may take a while. Do keep in mind that this mod was written several years ago. At the time it was working, obviously things have changed. Regarding the floating eyes, I don't see the issue. A log file and pics are now required. Your comment is somewhat disparaging, please consider your words before posting in the future. This IS working, but I can see your confusion. I've updated the OP with some more instructions regarding the keys used to control the Kerbal during EVA. Look at the new Settings page I just added for the option to force the IVA before launch. Note that you were always able to do IVA manually, this just forces it. Did you try hitting the "C" key to get into IVA mode? Regarding the floating eyes, I don't see the issue. A log file and pics are now required. Logs and pics would help to diagnose this, no argument. 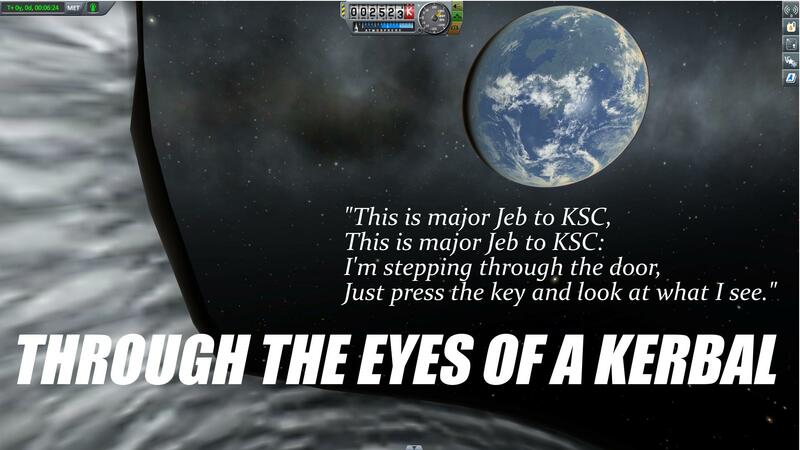 The floating Kerbal eyes thing is some conflict with this and Texture Replacer Replaced. You can also see the teeth. I'll post a pic is a second.